The later name for the lands east of the river Gelion and north of the Ascar. 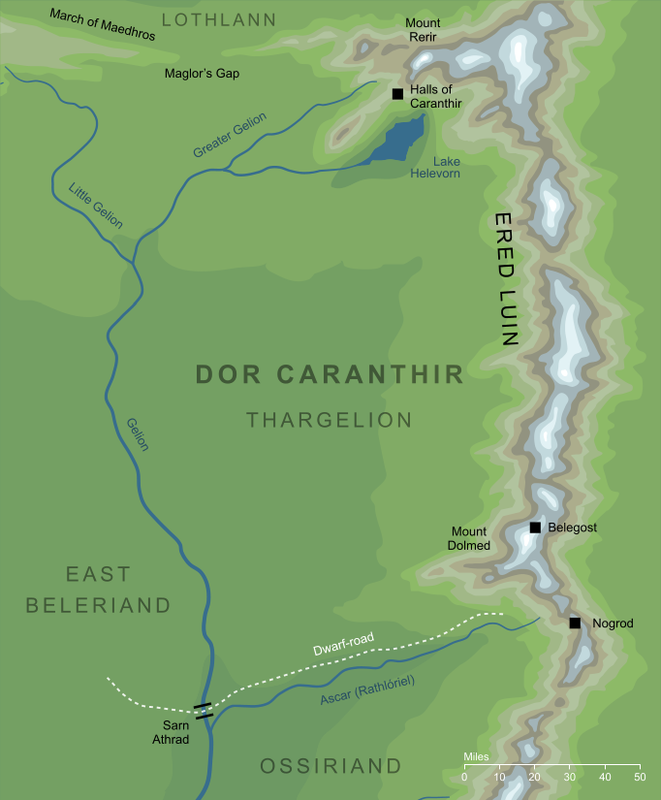 Originally known simply as Thargelion, the land beyond Gelion, they were settled by Fëanor's fourth son Caranthir and his people, after which this region became known as Dor Caranthir, 'Caranthir's land'. For a time, there was also a colony of Men living in the southern parts of Dor Caranthir. These Haladin were led away into the west by Haleth, to settle eventually in the Forest of Brethil. The geography of Dor Caranthir is generally well mapped, with the exception of the halls of Caranthir, whose location is only approximately known from textual references, and what references we have are hard to reconcile. According to Quenta Silmarillion 14, Of Beleriand and its Realms, '...beside [Helevorn] Caranthir had his abode...'. However, in QS 18, Of the Ruin of Beleriand and the Fall of Fingolfin, we're told of the fall of these halls '...the Orcs took the fortress upon the west slopes of Mount Rerir...'. Given the geography of this region, it is difficult to see how Caranthir's fortress could have been both beside the lake and on the western slopes of the mountain. The map above presents a compromise, placing the halls on the southwestern slope of the mountain, thus also allowing them to fall close to the shores of the lake. Original content © copyright Mark Fisher 2002, 2004, 2017. All rights reserved. For conditions of reuse, see the Site FAQ.